Everyone, regardless of background, must be equal under the law and equally subject to the law. There are serious questions around disparity in the application of the law by the Paramilitary Crime Task Force and the negative impact this is having on confidence in policing within working class unionist communities. Let me begin this piece by very clearly summarising the core point, lest anyone- either mistakenly or deliberately- misinterprets the argument being advanced. If there is criminal activity taking place, regardless of whom it is carried out by or from which community it emanates, then the perpetrators should be rooted out and placed before the courts. I am unequivocal on that point. However, the law must be applied equally and fairly. Everyone must be equal under the law, and equally subject to the law. That goes for loyalists, republicans, businessmen, politicians, police officers and everyone else living within our society. That leads us to the so-called Paramilitary Crime Task Force (PCTF), a political creation flowing from the Fresh Start agreement. For those who may have forgotten, the Fresh start agreement came about following the IRA murder of Kevin McGuigan in 2015. It was that paramilitary murder that ultimately spawned the PCTF. You would then be surprised to find that the PCTF has not carried out one single search, arrest or seizure against the Provisional IRA. Only yesterday the head of the PCTF, Superintendent Bobby Singleton, shared a panel with a man under investigation for allegedly running guns from Florida for the IRA. A man widely regarded as being the IRA’s Northern Commander and a member of the Army Council- which the Chief Constable says remains in existence with access to weapons. 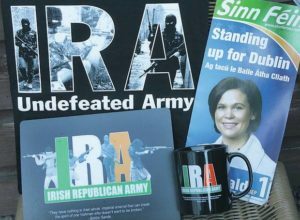 Take the PCTF’s kid-gloves treatment of the Provisional IRA, and contrast it with their relentless pursuit of loyalists. And I say again, if loyalists are engaged in crime then pursue that crime, but why is the law being applied robustly- and many would argue dubiously- against loyalists, and not being applied to the same degree against republicans? Let us take the PCTF’s ‘big success’ yesterday with the conviction, after a plea bargain, of David ‘Dee’ Coleman. I do not know Mr Coleman, and have never met him. I have no idea why he decided to take a plea bargain, and I have no idea what crime he was, or was not, involved in. I can however look beyond the spin of Mr Singleton, and what I see are some very serious questions. If Mr Coleman is involved in crime, then the PCTF have singularly failed to convict him of any such activity in of itself- beyond a dubious overarching membership charge under the terrorism act. It is the view of almost every lawyer, and anyone that would take even a cursory glance at the ‘case’ that the membership charge was never sticking. Mr Coleman’s own lawyer told the court that the “majority of the case was based upon circumstantial and hearsay evidence.” So why then take a plea? Well, a look at time already spent on remand would indicate that Mr Coleman will walk free in a matter of weeks. It is no secret he has a substantial criminal record and if one takes the view that another conviction, to add to a lengthy list, isn’t going to adversely impact your future career path, then it is logical that Mr Coleman may have concluded that he might as well take a plea bargain rather than roll a dice- even one loaded in his favour- and risk even the smallest chance of a conviction after trial and a substantially greater sentence. If we then look at the evidence the PCTF presented to the media – none of the items, in of themselves, are illegal. Even taken cumulatively, they do not amount to enough evidence to secure a conviction. Mr Singleton himself sought to address this point, when he made reference to previous commentary and criticism around why the PCTF were seizing such items which were not illegal. He argues they can be corroborating evidence. Mr Singleton did not of course have the courage to direct his comments at the source of such commentary, namely a range of articles I have written on this site, instead making a rather vague reference. If Mr Singleton wishes to debate the merits of the PCTF’s seizing of such material, then I am happy to publicly do so with him, he doesn’t need to throw sneaky lines into his press briefings. On a rather irrelevant- but amusing- point, I notice Belfast Live attributed Mr Singleton’s aforementioned comments – which were recorded and published by the Belfast Telegraph- as coming from a “police source”. Contrary to his assertions, it wouldn’t be the first time Bobby Singleton has been an off the record police source. The circumstantial material seized is used for tactical purposes, namely to build a prima-facie case that will allow for a holding charge, which will place the suspect on stringent bail conditions and/or a lengthy period of remand. Then, like the Coleman case, the PCTF bet on the suspect- who may often be a person with a substantial criminal record- deciding it’s easier to take a plea for effectively time served rather than taking the risk of running a trial. And so the PCTF end up with a conviction based upon a dubious and circumstantial case which is unlikely to have survived a trial. If Mr Singleton is placing so much stock in material such as that presented to the media yesterday as crucial corroborating evidence, then when will the PCTF be raiding Sinn Fein’s Headquarters, or their Falls Road museum? If the PCTF are going to build cases upon what they say is ‘material indicative of membership’, then why aren’t they building the same cases against republicans as they are against loyalists? There was also reference by the PCTF to ‘photographs beside murals’. This is interesting, when will they be building cases against tourists, or more importantly Sinn Fein members that regularly give press conferences in front of IRA murals or memorials? You see, herein lies the disparity. The PCTF will take one approach for loyalists and an entirely different approach to republicans. 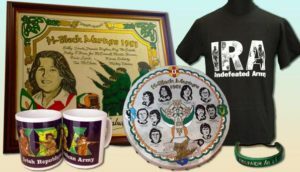 If memorabilia is indicative of membership, then that must apply to membership of the Provisional IRA every bit as much as it applies to membership of the UVF or UDA. If not, why not? Perhaps if some mischievous soul was to make a criminal complaint against the IRA museum on the Falls Road then such disparity could be flushed out. We also then look at the PCTF ‘communications’ strategy. One would think they learnt nothing from the Cliff Richard judgement. They continue to consider bringing the media for a ride along to arrest operations, often leading to a person’s home being filmed and broadcast, and issue press statements that jig-saw ID suspects and make irrelevant and fanciful allegations to spice it up a bit for the press. Regardless of who or what the suspect is, or is not, is everyone not entitled to fair and due process and the presumption of innocence? All of this leads us to establishing our own prima-facie case that the PCTF are applying the law unequally, and often unfairly. They bank on being able to get away with it because the majority of people couldn’t care less if the police bend the rules a little bit to lock up criminals. I understand that, but is that the society we want to live in? Whereby the law is applied differently depending on who you are, or your past crimes or public profile? If someone is a criminal then build a case against them beyond all reasonable doubt, and then the PCTF will have good grounds to broadcast their success, which all sensible people would welcome in such circumstances. Confidence in policing is being rapidly eroded within working class unionist and loyalist communities. The PCTF yesterday attended an event organised by the Falls Community council, and as previously mentioned sat on a panel with a man widely regarded as a member of the IRA Army Council, and faced questions from the audience. As you can imagine there were little or no difficult questions for Mr Singleton. If it is good enough to go to events run by the Falls Community council and engage with a predominately republican audience to explain the actions of the PCTF, then why are the same opportunities to raise concerns not afforded to the loyalist community? There is, this Monday night (24th September) a public consultation on policing organised by the Policing Board being held in the Signal centre in Bangor. Will Mr Singleton, or a PCTF representative, come to this public event and engage in respectful debate and discussion with the unionist community? There may be very valid answers to many of the general points I have raised about the work of the PCTF, but how can such concerns be addressed if the PCTF refuse to openly and publically engage with the unionist community in the same manner they publically engage with the republican community? The pursuit of crime is a good thing. The law is the social code that governs our society. Let us ensure however that the upholding of the law is done fairly, and with due process. Everyone equal under the law, and equally subject to the law.